Sometimes I have a craving to eat something sweet. But I really don’t like to gorge on Indian sweet dishes especially store bought ones as they do contain a ton of butter or ghee. So I prefer trying out some easy fruit based dessert options for those times that I like to have dessert!! I accidentally came across this commodity called phyllo cups. 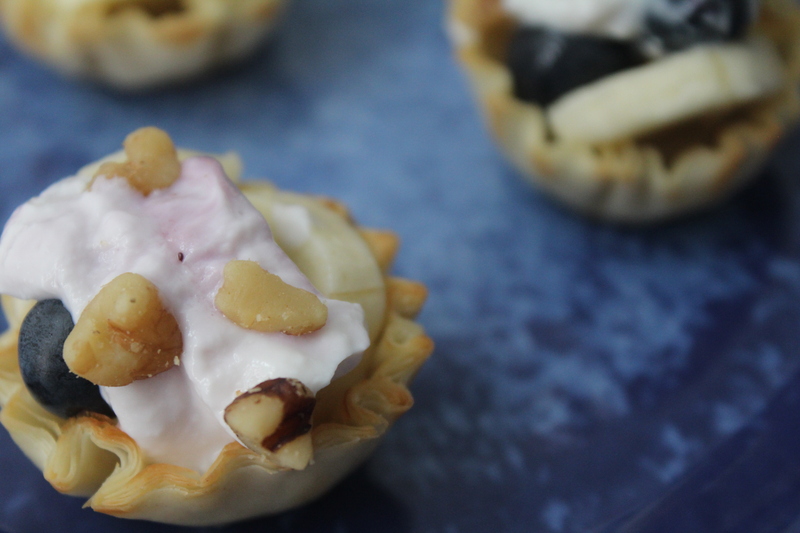 If you have never used it, phyllo cups are pre-made cup moulds made from flour. You could also make these cups at home, but the ready made ones are a real time saver. You get these at any grocery store. You can bake these cups with any filling of your choice to get an appetizer or dessert 🙂 On one of the phyllo cup packages, there were some beautiful pictures to give some recipe suggestions. 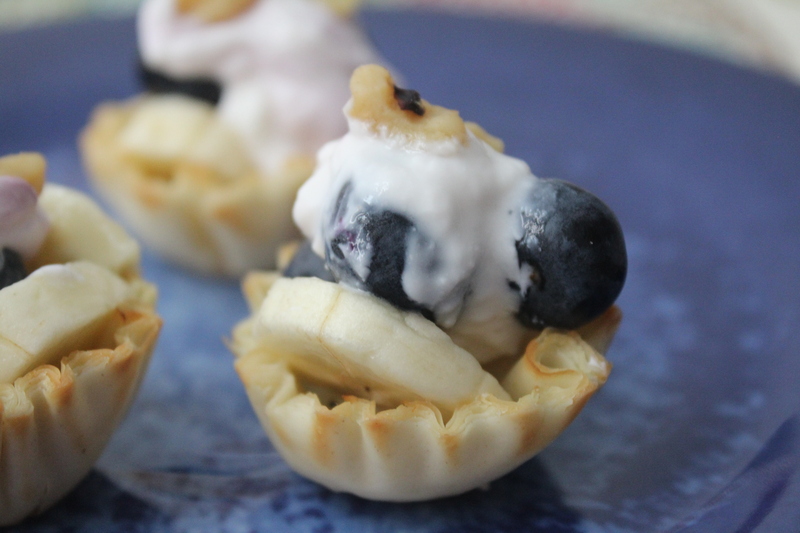 I loved the one in which they had berries in the phyllo cups. I just tried it myself and wanted to share it here. I added my touch to it by topping with some fat free Greek yogurt and nuts :). Definitely this is a winning recipe because of its ease and simplicity. And nothing can beat the taste of fresh fruit combined with the crunch of the phyllo cups and nuts along with the coolness of yogurt!!!! Preheat the oven to 350 degrees F for 5 min. Line a baking tray with parchment paper and place the phyllo cups on it. Bake it in the oven for about 3-4 minutes. Once the cups cool down, work on the filling. Place two slices of banana and a few blueberries. Finally top it with a spoonful of greek yogurt and some chopped nuts! 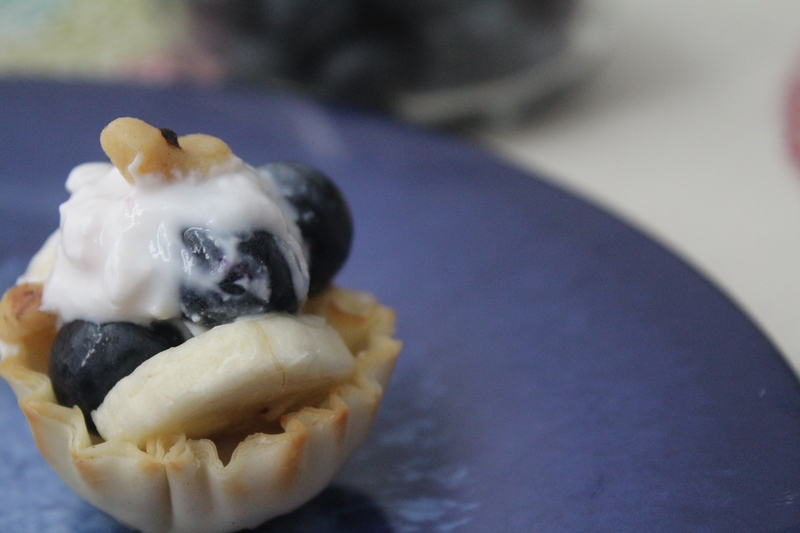 Serve these colorful healthy treats immediately!